Welcome aboard, explorer! 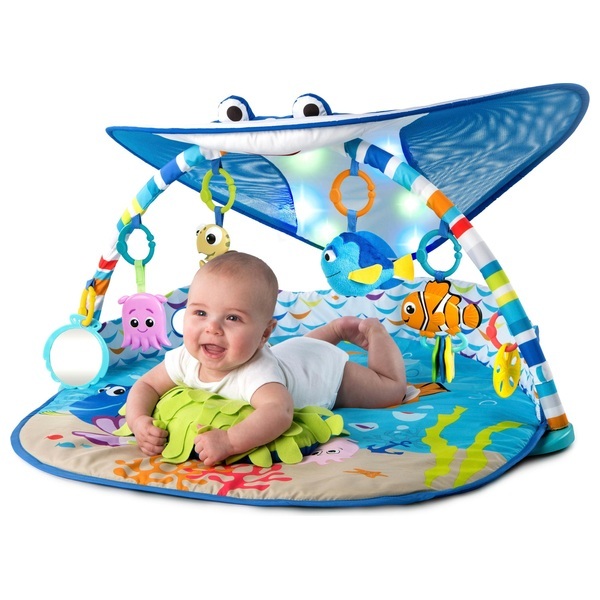 Let your baby pal around with Mr. Ray, Nemo, and friends in the Mr. Ray Ocean Lights Activity Gym. Mr. Ray's captivating canopy environment is filled with lights, music, puppet play and more! Capture baby's imagination with 20+ minutes of ocean- themed melodies for fun and auditory stimulation. Includes six detachable take-along toys for baby to get their hands on including a Dory finger puppet for co-play during storytelling, baby-safe self- discovery clamshell mirror, Squirt rattle filled with colourful beads, Nemo bead chaser, tug-able Pearl the octopus, and sand dollar teether. The removable contoured prop pillow provides support for baby during tummy time. When things get a little messy, simply remove the toy bars and toss the play mat into the washing machine.